Dutch Christian Old Testament scholar; born in Haarlem, North Holland, Sept. 16, 1828; died in Leyden Dec. 10, 1891. He was educated at Leyden (1846-51), where in 1852 he was appointed assistant professor, and in 1855 professor, in the theological faculty; and there he remained until his death. He was one of the leaders of the modern school of Old Testament critics. His chief work is an introduction to the Old Testament ("Historisch-Kritisch Onderzoek," etc., 3 vols. 1861-63; of the second edition, 1885 et seq., the third part was left unfinished at his death). There is an English translation of the first part ("The Hexateuch," by P. H. Wicksteed, 1886), and a German translation of the whole ("Historisch-Kritische Einleitung," etc., by Th. Weber and C. Th. Müller, 1886 et seq.). The most important critical problems are discussed with masterly method in many articles, especially in the "Theologisch Tijdschrift" (1867 et seq. ), of which Kuenen was one of the editors. Special mention is appropriate here of his investigations of the membership of the Sanhedrin (1866), the men of the Great Synagogue (1876), and the genealogy of the Masoretic text (1873), published in the transactions of the Amsterdam Academy of Sciences ("Verslagen en Mededeelingen"). These, with a number of the articles in periodicals, may be found in a German translation by Budde in "Gesammelte Abhandlungen zur Biblischen Wissenschaft von Dr. A. Kuenen" (1894). 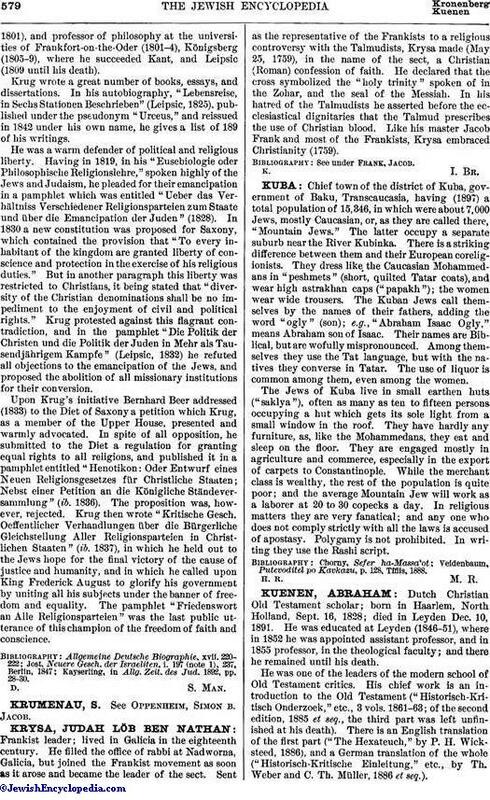 The first noteworthy attempt to construe the history of the Hebrew religion from the premises of the new critical school was Kuenen's "Godsdienst van Israël," 2 vols. 1869-1870 (English transl., "The Religion of Israel to the Fall of the Jewish State," 3 vols., 1874-75). In this work Kuenen accepted the opinion, which Graf had revived in 1866, that the ceremonial law is the latest part of the Hebrew legislation. He made Graf's theory consequent by including with the Law the cognate histories in the Hexateuch; and discovered in Neh. viii.-x. a counterpart to II Kings xxii.-xxiii., narrating the introduction of the priestly laws by Ezra. The chief significance of his "National Religions and Universal Religions" (Hibbert Lectures for 1882) also lies in the chapters on Judaism, and on Christianity in its relations to Judaism. "De Profeten," 1875 (English transl., "The Prophets and Prophecy in Israel," 1877), is rather a refutation of dogmatic supernaturalism than a complete study of the phenomena of prophecy. 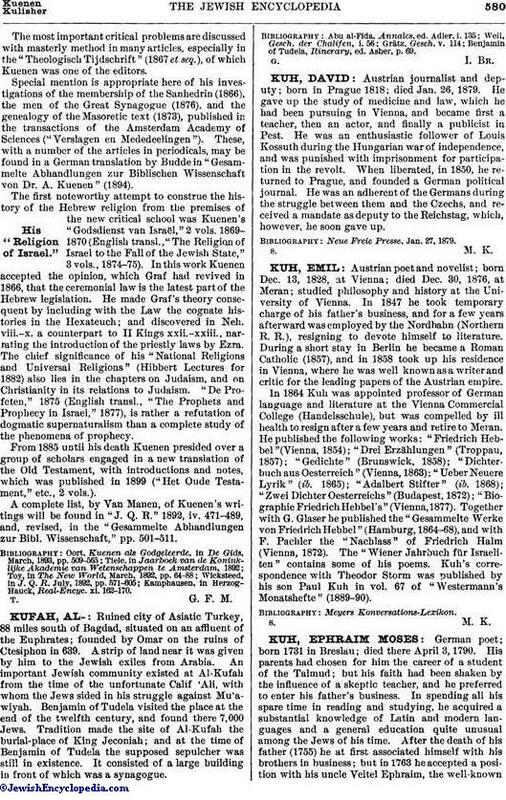 From 1885 until his death Kuenen presided over a group of scholars engaged in a new translation of the Old Testament, with introductions and notes, which was published in 1899 ("Het Oude Testament," etc., 2 vols.). A complete list, by Van Manen, of Kuenen's writings will be found in "J. Q. R." 1892, iv. 471-489, and, revised, in the "Gesammelte Abhandlungen zur Bibl. Wissenschaft," pp. 501-511. Kamphausen, in Herzog-Hauck, Real-Encyc. xi. 162-170.